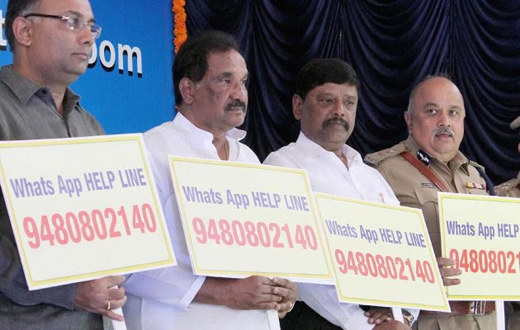 Mangaluru, Mar 17,2017: In the light of rising cases of thefts occurring in the trains and harassment of passengers by co-passengers, the state government has introduced WhatsApp facility for passengers which will enable them to register complaints. For the first time in the country this facility has been made available for the passengers, thus saving them from the ordeal of waiting to reach the next station for filing complaint or dialing 100 (police control room). According to the new system the passengers can send a WhatsApp message to 9480802140, which includes brief details about the incident, train and coach numbers. S.N. Siddaramappa, Superintendent of Police (Railways) said these complaints will be addressed by a team which has been constituted for this purpose. As many as 300 special officers, mainly regular commuters have been appointed to help the police in investigations. Identity cards have been given to the special officers. A round the clock toll free number (18004241363) has been set up to enable passengers to register their complaints and also get information. Bangalore Development Minister, K J George said the new facility will go a long way in helping the department to detect crime and also to reduce crime rate. The mobile apps these days are more preferable as it will be possible from the location wherever we are and no need of panic in case of emergency .